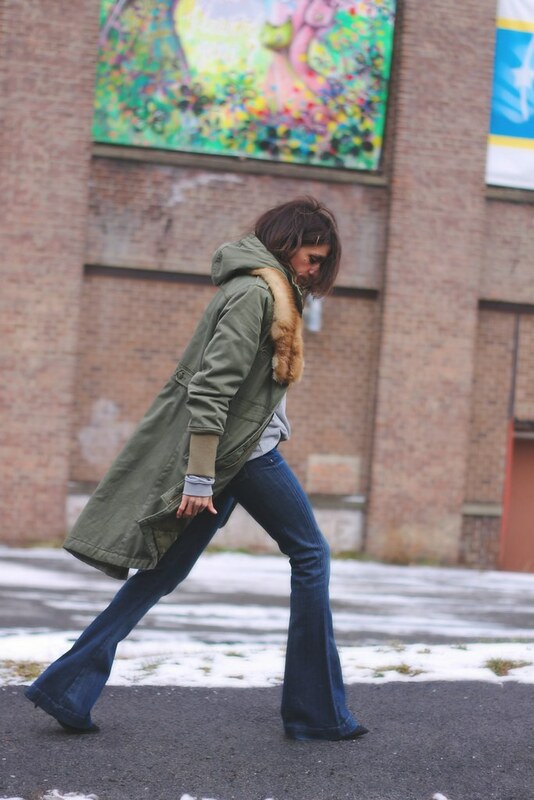 This look was totally inspired by this military parka post. 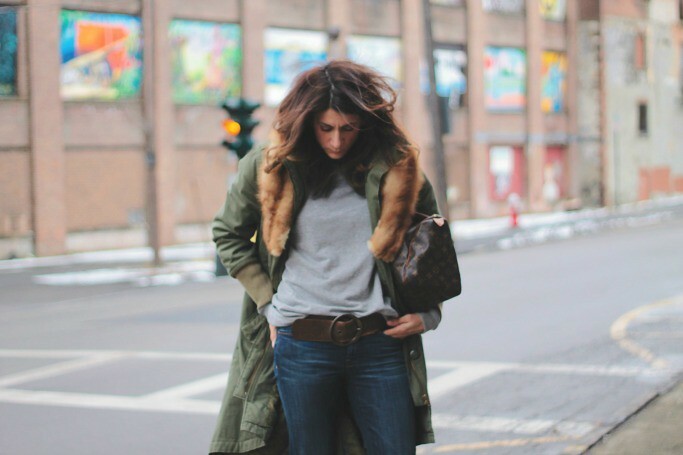 I completely forgot about this olive coat and adding this faux fur collar was just the update it needed. I actually went looking for a faux fur collar specifically for this look. I hopped over to one of my favorite vintage shops and found one...that like, never happens. Anytime I am looking for something specific, it usually takes forever to actually find it. As you have seen from this previous post, this little faux fur is fitting very nicely into my wardrobe. Don't forget to enter the $1,000 exotic clutch giveaway!!!! Yesterday the Bloglovin' entry wasn't working, but its all corrected now, so go back and get your 2 extra entries! Coat-H&M (similar) . Sweatshirt-H&M . Jeans 7FAM (similar). Belt- Vintage . Faux fur collar-Vintage. Bag-Louis Vuitton "speedy"
This entry was posted on Wednesday, January 29, 2014 and is filed under denim,faux fur,green,grey,vintage. You can follow any responses to this entry through the RSS 2.0. You can leave a response. 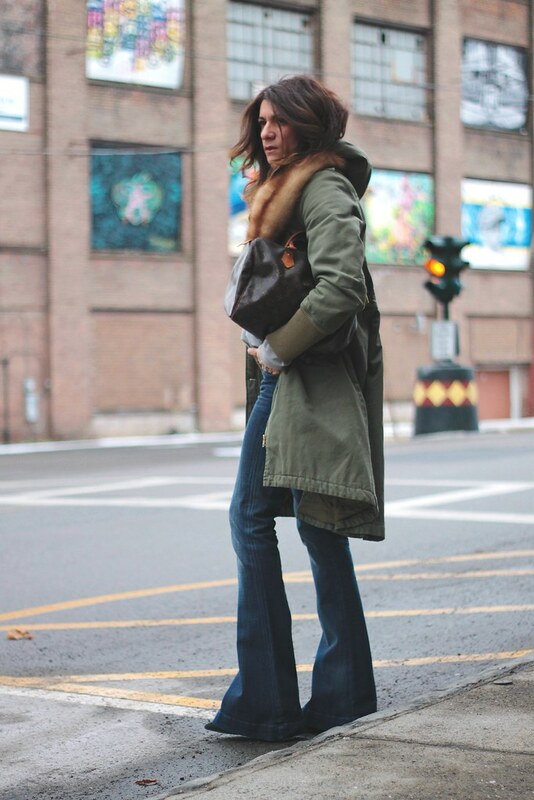 You rock those flares like no one else, Sheree!! And the little furry collar is perfect for elevating your military jacket from "utilitarian chic" to "downtown glamorous!!" So cool! Loved that coat!! Just found your site. Like it. I love the outfit photos and love that you're a mom who's still fashionable ( like me). And I share the pain with the cold weather photos. It's been -36 here in Toronto! Killer look - LOVE IT!!!! Very nice! Love the flares. 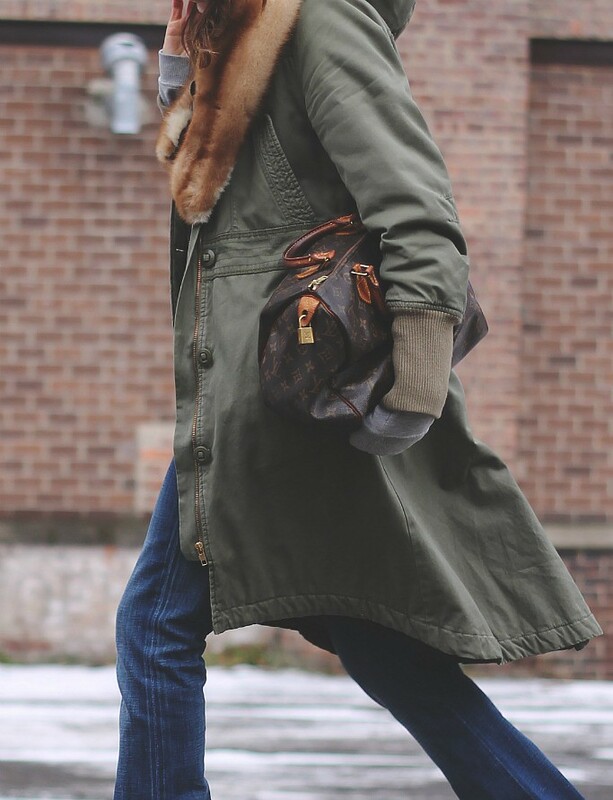 holy chicness……..I have an olive trench and an olive bomber but no parka……the parka just looks so damn cool….but then again its also because of the person wearing it! You have a gift for taking the simplest pieces and making them stellar! I swear I love everything you wear! I wish I could pull of half of it. Score on finding the fur collar...that never happens to me either!! This jacket is gorgeous! I love the fur! Flared jeans look so great on you! And I love how the fur stole looks with an army jacket,very unexpected but great! Those jeans are just perfect!!!! Can u visit my blog? I'm quite new. comment and if you like it, follow!